That's Concord Church Road, a relatively well traveled secondary road in Lewisville, at about 3:30 on Sunday. That's gonna be one slick road tonight and in the morning and I have a feeling that there are roads just like it all over the county. 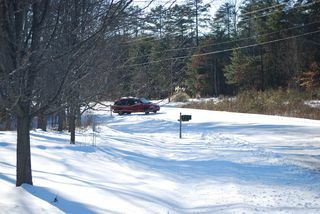 This entry was posted in Forsyth County, Lewisville, Winston-Salem and tagged snow days, winston-salem forsyth county schools, wsfcs on January 31, 2010 by Jon Lowder.